Born in in Mullingar, County Westmeath and a member of the Traveller community, he was born John Joseph Nevin but is now more commonly known as John Joe! For Irish people, John Joe Nevin is more than a great athlete sprung from our native soil. 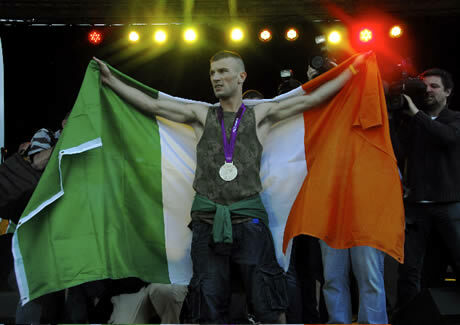 He is widely thought of as the golden boy of Irish boxing but people also see John Joe as a hero coming from humble beginnings to rise to the top and qualify for not one, but two Olympic Games! John Joe's road to becoming an Olympic silver medalist began when he won his first fight in the 2012 Olympic Games, defeating Denmark's Dennis Ceylan by a wide margin of 21--6. In his second fight of the games, he saw off Kazakhstan's Kanat Abutalipov by a margin of 15--10. In his quarter-final bout he beat Oscar Valdez to secure a semi-final place and a guarantee of a bronze medal. He then reached the final after defeating the reigning bantamweight world champion Lázaro Álvarez of Cuba 19--14. He won silver, losing in the final to Luke Campbell of the UK 14--11.